I’ve been trying some fun things with purées, ideas I learned about in Heidi Corley Barto’s The Natural Soap Chef. 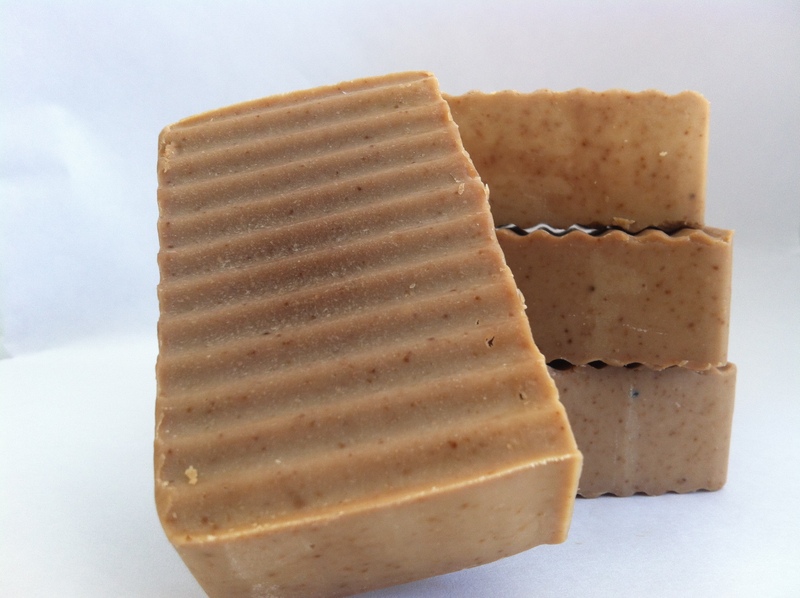 The first soap is a banana/coconut milk purée-based soap scented with Bramble Berry’s Monkey Love fragrance oil, a recipe you can find in Barto’s book. She calls it Bananas Foster, but I like Funky Monkey better. You can see little flecks of banana in the soap. It has a sort of interesting, uneven color that might be the result of a partial gel, but it doesn’t look as dramatic as some of the partial gel images I’ve seen of other soap, so I’m not sure. I decided to try to prevent this soap from gelling and put it in the fridge because my previous milk soaps had not turned out well, and this one seemed to be kind of cranky as I was mixing the lye. I like the way it turned out. 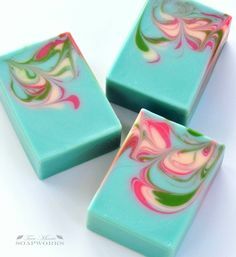 It smells great, and I think it is going to be a very nice soap to use. This next soap has an interesting story. 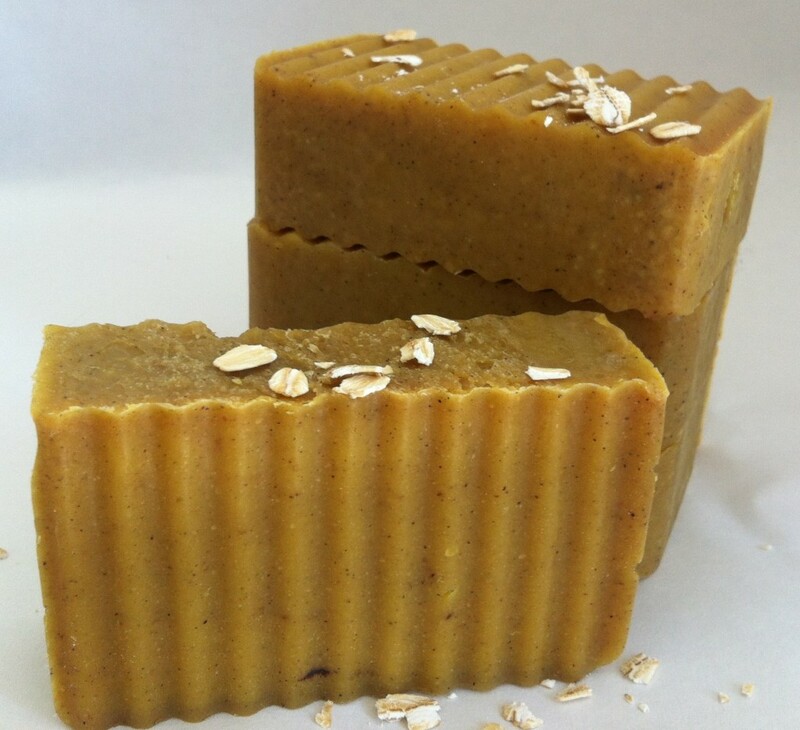 Pumpkin pie soap was one of the first soap ideas I ran across that I told myself I HAD to make, and I believe I first encountered it on the Lovin Soap Blog, but it’s a hot process recipe, and I prefer cold process. However, the Soap Queen also has a great CP pumpkin purée soap tutorial. Heidi Corley Barto also has one in The Natural Soap Chef. 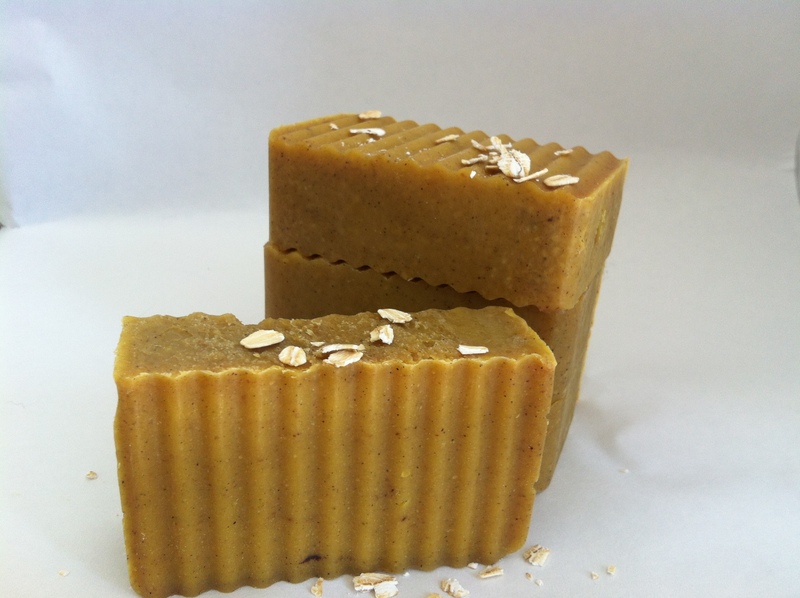 Meet my Pumpkin Pie Soap! I didn’t come up with the idea, but I used my own recipe and technique for producing it. I share the percents because I think it’s easier to make the recipe for your own mold if you know percents. You would then just use a lye calculator to figure out how much lye, water, and pumpkin purée to use. In my soap, I used One Pie Pumpkin. 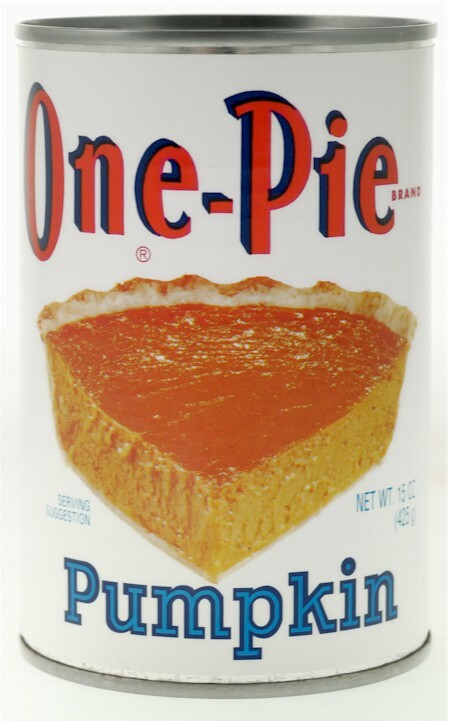 One Pie Pumpkin is very special pumpkin. Yankee Magazine calls it New England’s unofficial brand. It isn’t available widely outside of New England, and some of my research indicates that some areas only sell it seasonally during fall and winter for Thanksgiving and Christmas. I haven’t lived in Worcester, MA long enough to find out if that is the case here, too, but I intend to find out. If it is, this could be one very special soap. I really like that the recipe uses an old New England product that been used for generations. It makes the soap more interesting to me. I halved the amount of water called for by the recipe and mixed my lye with water, then I made up the remaining amount of water with One Pie Pumpkin. My recipe called for 5.61 oz. lye and 13.18 oz. water, so I used 6.59 oz. water and 6.59 oz. pumpkin purée. I added the pumpkin directly to the oils and stick blended the mixture to combine, then I added the lye/water and stick blended to a light trace. It blended fairly quickly. I used Bramble Berry’s Pumpkin Pie fragrance oil for scent. It smells great. I did notice that it accelerated trace in my own soap, so add it at a fairly light trace. I actually didn’t need to stick blend anymore after I added it. 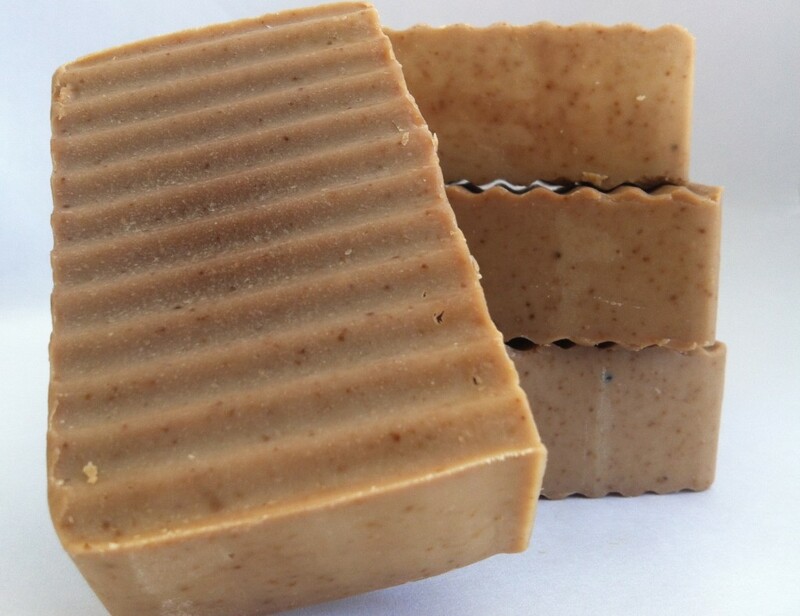 Next time I make it, I might add my pumpkin pie spice to the soap and stick blend it before I add the fragrance oil just so the spice is incorporated fully. I had not intended to gel the soap, but it was gelling in the fridge anyway, and it was starting to develop a crack, which I fixed. Since I figured it would gel anyway, I took it out to prevent a partial gel. I don’t have anything to compare it to, since I haven’t made this soap before, but I think gelling it gave it a really nice, rich pumpkin color. The soap looks great and smells amazing. 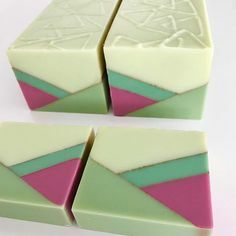 I love many of the soaps I’ve made, but I think this one might be my favorite, just because it smells so great and was so much fun to make, and it also has this interesting New England connection. I can’t wait to use it. Thanks, Anne-Marie! I ♥ Bramble Berry!